Miniatur Wunderland is a model railway exhibit consisting of nearly 16,000 meters of train tracks and representing many places around the world. Started in 2000 by twin brothers Frederik and Gerrit Braun, the Wunderland has been built with an eye for detail, humor and fantasy. It has become one of the most popular tourist destinations in Germany, but many of the places you will explore in this website are not visible to the average visitor. Enjoy taking a closer look at the Wunderland through this mini-Street View. Discover this fully-functioning miniature airport complete with departures, landings and a long line at the check-in counter. Discover this Southern German region and enjoy its most famous attraction: Neuschwanstein Castle. Discover the diversity of the small Alpine state with its dreamy mountain villages and trains at dizzying heights. Discover the beauty of the Austrian countryside on a train, bike or chairlift. Discover a slower pace of life and take in the social scene at the Rummelplatz and the Dorfplatz. Discover this tiny fictional town and the lives of its 10,000 inhabitants. Discover the famous sights of America, from deep canyons to glitz and glamour. Discover flying elves, a ghost ship and a moose-drawn carriage in this humorous look at Scandinavia. 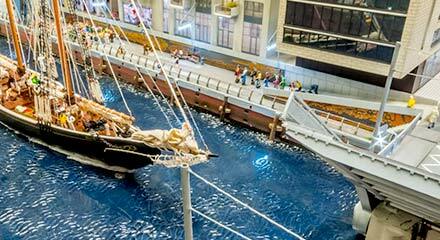 Discover boat rides along the port and a soccer match in this replica of the real city. The Bavarian Oktoberfest is the world’s biggest festival, and now also a successful export with celebrations around the world. Women in dirndls and men in lederhosen enjoy beer and pretzels around the maypole in the heart of the village square. Join in the celebrations and cheer on the parade with the brass band. Tractor pulling is one of the most popular pastimes among German farmers. Join in the fun and see for yourself how far the heavy-laden vehicles can be pulled. The Rhaetian Railway travels over the imposingly high pillars of the Landwasser Viaduct in the Swiss mountains, past the world-famous Swiss landmark: the six-meter-high Matterhorn. The passengers have a fantastic view, but they will probably miss one thing: the submarine emerging from the lake. The Swiss “King of Dance” puts on a huge show with Buddha and fountains and the fans are going crazy. But the 21,000 men and women dancing and partying are not the only ones enjoying the music. Have you spotted the cows and the flying carpet yet? Look carefully! There are a number of curiosities hidden in the crowd. When the festivalgoers turn away from the stage, do they know that they are looking at one of the most expensive plots of building land in the world? This very piece of land was auctioned off by the Miniatur Wunderland in 2007 for the benefit of children’s charities for 154,000 Euros per square meter – as expensive as building land in New York or London. The party continues on the campsite. People are dancing, drinking, and barbecuing – and even the nuns are no guarantee that all the visitors will behave themselves. From conga lines to clothes lines, see what you can spot in the campground. It proudly towers above the picturesque mountain landscape: the world-famous Neuschwanstein Castle. Almost as elaborate as the original, the model here is has been constructed in great detail and is very accurate. It took the designers more than a year to build the towers, gables, balconies, and battlements from more than 6,000 individual parts. Huge cranes transport loads, construction workers climb to dizzying heights and the large bridge construction site holds magical appeal for the beholder. Cars and trucks drive along the narrow switchbacks below. And what’s happening just around the bend? A car driver has become impatient and is attempting a risky overtaking maneuver. Northern Sweden is one of the most northerly points of Miniatur Wunderland. The bitter cold doesn’t seem to bother the red Dala horses. A weather balloon rises to collect the latest weather data. With a real eye for detail, the creators have made the glistening snow from the finest glass dust. Life in the classic Swiss town is lived at a leisurely pace. The residents enjoy their lunchtime in the pedestrian zone. Some use the opportunity to shop for new clothes. Others just enjoy reading the paper and strolling around town. In the background is the headquarters of Swiss Post, one of Switzerland’s largest employers. Next to the winter scene you can see this town square in autumn. The flags tell us that we are in Norway where families are enjoying the afternoon outside their colorful wooden houses. On the steps you can see a bride and groom who have just said "I do!" Experience the steep walls of the Grand Canyon. Downstream the Grim Reaper awaits the rafters in their rubber dinghies. Or perhaps he just wanted to experience the thrill of a ride along the rapids? Pan around to see a steam locomotive lost to the power of the raging waters of the Colorado River. Las Vegas, the legendary gambler’s paradise, shimmers in all colors. Some 60,000 LEDs light up the buildings, while cars cruise along the streets. The buildings are replicas of the originals, such as the famous Hotel Luxor and the Casino Royale. It took technicians six weeks to solder all the little lights to illuminate the Las Vegas strip. Who isn't familiar with the stone monument dedicated to former US presidents Washington, Jefferson, Roosevelt, and Lincoln? Of course, this famous landmark had to be included in the American section of the Wunderland. It has been meticulously formed from plaster and then inserted into the model mountainscape. No fewer than 30,000 liters of water flow into the northern part of the Baltic Sea in Miniatur Wunderland. Care has been taken to ensure that everything is realistic here too: the 25 ships that sail must adapt their course to the tides. The water rises and falls in 25-minute cycles. Have you spotted the moose pulling a little wooden hut? NASA’s legendary space shuttle Endeavour is flying into space again! You can watch the launch live here at the mini Cape Canaveral. The original shuttle has long since retired to a museum in the California Space Center in Los Angeles. Notice the skyline of Las Vegas in the distance. The jet bridges also move automatically and adapt precisely to the plane that has just landed. The planes' movements on the ground are precisely controlled by an overhead infrared system. More than 40 different planes move independently around the airport. First they taxi to the gate and are pushed back by a vehicle in order to then taxi to the runway, where they accelerate and take off. There is a special timetable for all of this activity, which is displayed on two screens. This allows spectators to follow which planes are taking off and landing - in real time. If the planes are delayed, all the other service vehicles adapt to the new times. It's Christmas all year round in this American mountain town. 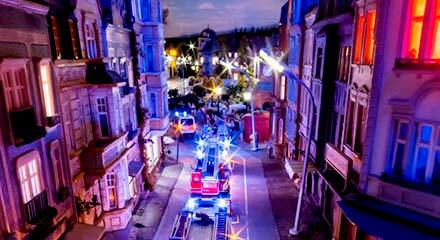 In December, the little Santas will spread out all over Miniatur Wunderland to deliver presents in time for Christmas. Click around the airport to see people getting on and off various flights at the airport or waiting inside for their planes to arrive. On the ground employees carry out a variety of tasks. 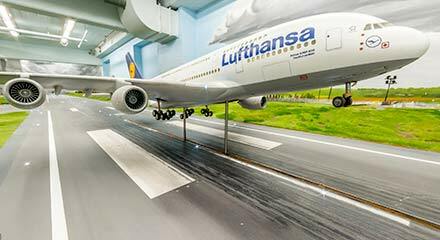 Visitors to Miniatur Wunderland are often fascinated by the fully functioning airport, and even the residents are in awe: you can see them lined up on the roof terrace to watch the comings and goings. The street and the parking lot in front of the airport are busy as always. There are over 4000 cars in the parking garage - no other section of the Wunderland is home to this many vehicles. Real-life visitors can discover many interesting things going on in front of the highly detailed airport that has taken more than 5 years to build. Just like in real life, planes are towed into the hangar rather than driven at Knuffingen Airport, for safety reasons. The model airplanes' intricate technology is continued inside the hangar: the sliding doors open automatically when a plane approaches and close again once it has entered. A replica of the terminal building at Hamburg Airport has been built down to the last detail. The color scheme and the designs – from the display boards to the telephone booths – are all true to the original. Each of the 15-millimeter-high figures has their own luggage. 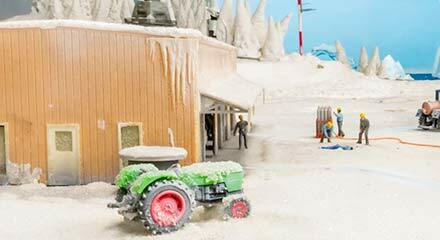 This image gives you an insight into the scene that remains hidden to the visitors at Miniatur Wunderland as the roof of the airport was removed to capture these panoramas. The turbines are already turning and the Airbus A380 is about to take off. The model of the world’s largest passenger plane has a wingspan of 79.8 cm and sports 134 LED lamps. In the background the Antonov taxies to the runway prior to takeoff. See how the cyclists struggle on the mountain stage! One rider has fallen on the bend and is receiving medical treatment. In the background a cyclist is fed up with the strenuous effort and decides to throw his bike over the barrier. The atmosphere is really lively at the biggest fair in Central Germany, the country fair and flea market in Bad Arolsen. Men, women, and children flock to the carousels and the chamber of horrors. A ride on the “Wild Mouse” roller coaster is less advisable – there is a pretty good chance that the delicate mechanism will jam and break down. In its 15 years of existence, it has been repaired at least once a week. Have you spotted the divers? The mountains are calling! This is actually a night ski session, when the snow is at its best. Equipped with torches, the skiers glide elegantly down the mountain. Can you spot the cyclist who has lost his way in the deep snow? This is where it all began. 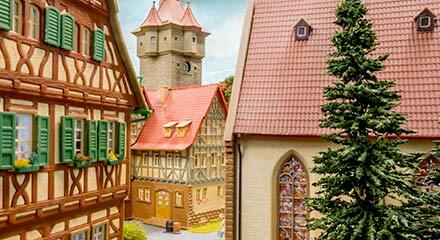 Opened in 2001 as one of the three original sections, Central Germany is one of the most hidden corners of Miniatur Wunderland, which normally cannot be seen like this. The idyllic half-timber houses and church with stained-glass windows are the setting for a quaint village life, where people have time to stop and chat by the village fountain. It’s all about business in HafenCity. Tourists mingle with businesspeople between modern office blocks. Demonstrators stick a poster on the Elbphilharmonie to draw attention to the excessive costs. A tow truck cracks down on illegally parked vehicles – and efficiently stacks several cars on top of each other. All aboard, please! Hamburg Central Station is one of the most frequented stations in Germany. The roof structure of the original is 45 meters high. You can see here how the station looked more than ten years ago. People were still allowed to smoke, for instance, whereas now there are smoking booths on the platforms. One of the ten most expensive skyscrapers in the world, the Elbphilharmonie in Hamburg is a political issue: loved by culture vultures, but harshly criticized by opponents due to the ever spiraling costs and frequent delays. Originally scheduled to open in 2010, it hasn't been completed yet. However, this shouldn’t bother visitors at Miniatur Wunderland. They can admire the completed mini Elbphilharmonie in all its glory. Look out for the bascule bridge, which opens to let ships through. The focus here is on being true to the original: the brick structure, ground, and facades are identical to the real thing in every detail. Have you spotted the person diving from a window of the Elbphilharmonie? Two anglers are also taking the opportunity to cast their rods into the water. To the delight of observant children, a few colorful bears – Käpt’n Blaubär and his friends – have made themselves comfortable high above on the ship’s mast. A little piece of contemporary history has been captured here: Hamburg’s “Generation Move” techno parade. Right at the front is the EFX float. This is a hint to the past: EFX was a series of regular techno events in the disco club owned by the founder of Miniatur Wunderland at the time. The German rowing eights are training on the Elbe for their next competition. Enjoy the view of HafenCity from the water, as if you were a guest on a cruise ship. Every year in September, the port of Hamburg is bathed in mystical blue light. The BLUE PORT light art project can also be admired in the model's street lighting at this time. Fire has broken out in the old tax office! Flames are flickering out of the roof; the fire teams are working through the night. In the background the Hamburg Film Festival is kicking off with an open-air cinema evening. Germany’s biggest church tower clock looks resplendent on top of St. Michaelis Church, lovingly referred to as Michel by the locals. Built in 1886, Block D in Hamburg’s warehouse district is the home of the actual Miniatur Wunderland, and is nearly identical to the original. The warehouse district has been a World Heritage Site since July 4, 2015. Take a look through the window on the fourth floor! 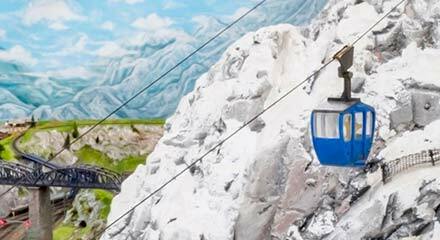 You will see Miniatur Wunderland’s smallest train, an ICE, moving around. Synchronized swimmers practice for the Olympics in the canal, and a man shows off his muscular strength by lifting a Smart car. After being built for over a year, the miniature Elbphilharmonie has been ceremoniously inaugurated. Having cost over 4 million Euros for completion, the model has required more than twice its planned budget. The Elbphilharmonie offers a very special moment for visitors of the Miniatur Wunderland: while the building opens up, musicians play "Peter and the Wolf" by Sergei Prokofiev. Fire! An apartment building is burning – and all hands are on deck: the fire department, ambulance service, police, and even THW, the German civil protection. More than 150 cars are racing to the scene; the police have even turned up from Knuffingen Airport. Herbertstrasse is Hamburg’s red light district, dating back to the19th century. The privacy screen you see here was constructed on the real street in 1933 to protect those walking by. Pan around and you will see a more innocent scene: fresh vegetables, cheese, and meat being sold at the popular market under the U-Bahn line. Today is market day in Knuffingen. The market is traditionally held across from the main fire department building, next to this beautiful church. The cars, trucks and buses driving on the busy road are all paying real-time prices for gas. The prices posted on the yellow gas station sign get fuel prices transmitted daily from an actual gas station in Hamburg. And have you spotted the Street View car? Click along one of the six tracks in the St. Wendel station and observe the passengers on the platform, as well as those already seated in the passing train. Follow the tracks into the tunnel and you'll see the track wind in an upward helix shape, allowing the train to emerge on the other side of the mountain. This track enables the train to climb 1.4 meters in just 4 minutes. Click down the tracks and through the tunnel to explore Bavaria's idyllic mountainscapes. See deer and stags grazing along the tracks and farms and villages in the distance. From the train you can see a view of Neuschwanstein Castle and the the airport, which is fully operational. 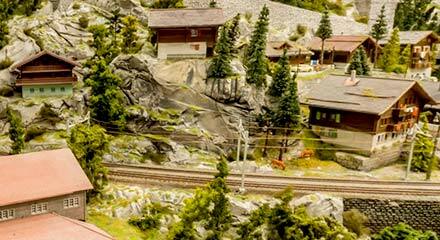 Click along the tracks to see the 5 ski lifts and an aerial lift in miniature Austria. It's high winter season in the peaceful village of Kitzstein. The mood is jolly, children have a snowball fight and build a snow man. In the background, a gondola lift transports skiers to the mountain peak. Passengers wait for departure in the blue cog railroad, a Tenderlok BR 91. Click along the runway as if you were a plane about to take off! Circle the airport along the hangar, administrative office buildings and the control tower, and experience an airplane's take off close-up. Attention has been paid to detail and you can see visible tire residue on the airfield, wind breakers protecting the luggage carts from air turbulences, a Space Shuttle, a Concorde or even a UFO landing. On the car ride through Knuffingen, you can get a first hand experience of everyday life, just like they would in one of the 90 self-driving cars in one of the biggest cities in the Miniatur Wunderland. Cops chase a cyclist while the garbage collectors work as usual. Graffiti artists have left their mark on a wall and the road has been blocked by a strange scene at the manhole. But don't speed in Knuffingen! There are two speed traps in Knuffingen. 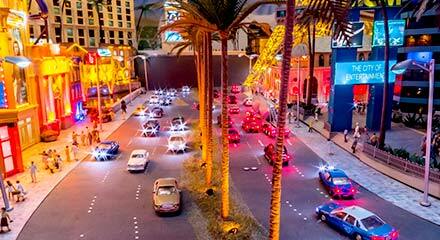 The entire car system in the Miniatur Wunderland ranges over 1.6 km. Click along the train track from the terminal station of Bergheim and get a special view over Knuffingen with Austria in the distance. The train tracks leading through Knuffingen extend over exactly 1 km. View closely and discover details that can't be seen by regular visitors, like the couple that's sitting comfortably on the meadow, enjoying their picnic. Or the eagle monument, donated by the Miniatur Wunderland's fictional Count Zu Löwenstein, whose grand estate is located in Knuffingen. Click along the tracks to see the largest industrial model of the entire site. Stretching over five square meters, this replica of the Holcim cement and concrete plant includes machinery and busy workers that keep production running. You can track the entire manufacturing process in miniature scale, from mining for raw materials to cement production to truck and train-based product delivery. Click towards the infamous peak ahead, the Matterhorn. To build the Swiss landmark in its full glory, a hole of about 100 sqm had to be broken in the ceiling. As you ride along, take in the view of the Landwasserviadukt below. But watch out! People are close to the tracks and some even ended up on the overhead contact lines. Click through one of the numerous tunnels and get a rare view of the inner workings of the within the Wunderland. These tunnels allow the trains to navigate through mountains and other supportive structures. A weight lifter seems to have lost their dumbbell along the side of the tracks. As you emerge from the tunnel, see if you can find the rock climbers practicing on the walls above. Click along the tracks and arrive at this station, where 40 trains pass through after traveling the 600 meters of tracks in miniature Austria. This station lets people off at the popular ski resort that you can see in the distance. At the end of the ride, you can see the wooden structures and the custom trim behind the scenes. Click through the Scandinavian countryside past this traditional windmill to explore one of the most popular ares of Miniatur Wunderland. Occupying 300 square meters of the exhibit, Scandinavia is home to the biggest structure in Wunderland – the eight-meter-long Storebæltbrücke (Great Belt Bridge). No fewer than 100 suspender cables made from 80 meters of fishing line hold the bridge on the main suspension cables. Just after the tunnel, you will pass through a typically Scandinavian town with its colorful houses, before reaching Egeskov Castle, which in reality is located on the Danish island of Funen. The castle was built completely by hand and took 250 hours of work. Click along the tracks of Knuffingen's idyllic environs. Nuns wait for the train, a woman mows the lawn and under the bridge a police man chases a pickpocket on horse back. Technology enthusiasts should enjoy the ride into the blue illuminated tunnel which reveals special views behind the scenes. It's lunchtime in this small German town and people have gathered to watch a traditional parade with a marching band. The flags indicate its a national holiday, but apparently not for everybody: the construction workers are only taking a short break for lunch before they get back to work repairing the road. On a hill above the village you can see a castle built in the traditional style of this part of Germany. In the distance is one of the longest bridges in Miniatur Wunderland, where the ICE high speed train line rushes to pick up its passengers. In the countryside, people are farming, grazing cattle and growing grapes in the vineyards. Click along the track at the busy Wandsbek station and you might spot a celebrity on the platform! Turn around and travel over the bridge and you'll encounter Hamburg's television tower, the city's highest building. Before you enter the tunnel, look to the left to see the gorgeous Dammtor station, called the Emperor's Station because emperor Wilhelm II attended its opening.